In this reviewer?s humble opinion, the Microsoft Xbox has seen at least two potential ?system-selling? games in the first half of its lifecycle. For fans of the first-person shooter, Halo (2001) created enormous buzz for its gorgeous graphics and diverse gameplay. Meanwhile, another fanbase fawned over the collision of Star Wars property and the role-playing genre, especially when it became known that BioWare (the brains behind the Baldur?s Gate series) were developing Star Wars: Knights of the Old Republic (2003). It seemed for a time that the only way to either game was through that green and black console. And Xbox owners rejoiced. Fortunately for the rest of us, however, Microsoft has a stranglehold on a far larger userbase ? that of the personal computer ? and both Halo and Knights of the Old Republic would find their way to the PC in 2003. Knights of the Old Republic (KOTOR) rewrites the book on what makes a legendary game. It is a perfect marriage of an epic plot, innovative combat, deep customization options, good production values. The scary part is, it can still be even better. The PC port of KOTOR has a few minor bugs, but the game is so good that it is a must-play anyway. As any veteran of this game will tell you, Knights of the Old Republic has the finest Star Wars plot to come out since the 1980?s. The game starts out running with a tutorial seamlessly integrated into the plot, and quickly thrusts you into the role of a Republic solider trying to do his or her duty. The plot is thick with character development, drama, and a multitude of meaningful sidequests, and KOTOR also contains a few of the more shocking plot twists I?ve ever experienced in a game. You begin the game by creating a character, which can be customized in respect to gender, abilities, skills, and feats. Abilities will ring familiar to many BioWare games, such as dexterity and wisdom, and of course heightened abilities lead to greater modifiers in your character?s other areas, such as reflexes. Skills include, persuasion, computer hacking, injury treatment, and the like. Feats include special combat attacks or increases in your ability to hit or do damage with specific weapons. Later on, moreover, characters in your party will have the ability to select Force powers in all varieties, from dark side lightning to light side healing. That brings us to another unique gameplay element. Throughout the game your character will be faced with dialogue trees that will often allow you to make decisions between good and evil. These decisions will eventually impact your affinity toward the light or dark side of the force, which in itself has a multitude of in-game implications. Affinity toward one side of the Force makes the use of those kids of force powers less expensive (and makes the opposing force pricier), opens up unique plotlines, and can in fact entirely change the course and outcome of the game. Best of all, the light and dark sides offer different enough experiences that there is genuine replay appeal in playing through the side you avoided the first time through. When you consider that one go-around with KOTOR takes somewhere between 40 and 50 hours, the sheer volume of potential gameplay is impressive, to say the least. Most of the action in KOTOR is in a pseudo real-time environment, much like Baldur?s Gate or Icewind Dale. Your characters seem to move in real time, but actually operate in turns dealing out damage via Dungeons and Dragons 3rd edition rules. You can pause the game to issue commands at any time, so KOTOR can be as fast-paced or slow and strategic as you want it to be. Not only that, but the game offers tremendous variety, whether it be you working as a mercenary out to eliminate a foe, serving an archaelogist searching through the remains of an ancient tomb, or gathering evidence for the defense counsel in a criminal trial. If BioWare has an Achilles? heel, it is its graphics engines. That?s not to say that their games look horrible. It just seems that their games, as great as they are, seem to be missing something graphically. The isometric view of the BioWare Infinity engine (which drives the Baldur?s Gate games) is a good example. Likewise, KOTOR?s Odyssey engine (based on the Aurora engine used in the Neverwinter Nights series) is certainly decent, but it?s not the complete eye candy you would hope it to be. First, though, the positives. 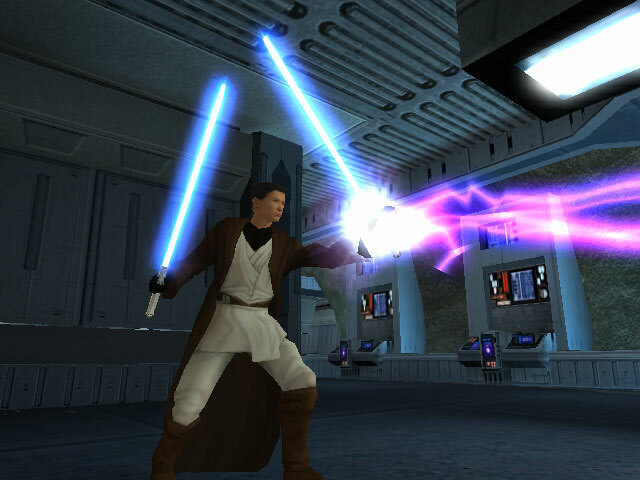 Unlike most RPG?s, most of KOTOR is played through a third-person, over-the-shoulder perspective. All the action happens right in front of you. Characters look pretty detailed and authentically reflect the diversity of the Star Wars universe. Combat, especially melee combat, is downright impressive; when two foes are dueling with swords or lightsabers, you will see characters spar and parry, rather than simply hack away at each other. Force powers generally pretty cool without being too over-the-top. As, mentioned, however, there are a few hitches. The graphics are good, but seem, well, a bit unpolished given the significant memory requirements. It?s hard to understand how a game like Dungeon Siege, for example, can offer up the same third-person view with downright smooth graphics while using only a fraction of the memory that KOTOR has. One would expect more from this game. Framerate is also an occasional problem. I consulted with a few friends with different ? and often superior ? computer setups to mine, and all of them reported back that there were a few framerate issues at points in the game, even with a high-end system using the game?s low-end graphics settings. Combat, while pretty, is occasionally choppy. Both the lack of polish and the framerate issues, we suspect, are due to the fact that KOTOR buffers up large sections of real estate in order to cut down on loading times. While this is certainly appreciated, it seems that other games have managed to find ways to deal with this issue without sacrificing graphical production. So the graphics, while certainly not bad by any means, still could have been better. One more graphical note worth mentioning here is the swoop bike racing engine and the turret combat engine. At an early point in the game, you are required to man a swoop bike (similar to a pod racer) in a race against time (not opponents). Not long after, you are allowed to take control of a turret on a starship, much like one found on the Millennium Falcon. Quite frankly, neither of these engines are particularly pretty or well-executed. While I applaud BioWare?s attempt to broaden the scope of the game beyond simple person-to-person combat, I would have traded both in for more time spent refining the game?s regular engine. It is, I guess, a matter of preference. Simply stated, the sound in KOTOR is phenomenal. The music was is not the work of John Williams, but in truth it is a refreshing change of pace that is still fully appropriate to the Star Wars universe. Jeremy Soule?s impressive score is all fully orchestrated and features everything from haunting sonatas to brassy battle anthems? and even a few chords Star Wars fans will recognize instantly. A lot of the game?s tracks are memorable, especially in the context of the major events in the game in which they occur. Each planet has its own melodies as well, and they all accentuate the ambient mood almost seamlessly. With the exception of the player?s character, every single word of dialogue is spoken, whether it is in common speak or some obscure Wookie dialect, and the voicework is some of the best I?ve experienced to date. Standout voiceover veteran Jennifer Hale (Metal Gear Solid series, Eternal Darkness) gives a unique and compelling performance as Bastila Shan, and Raphael Sbarge serves up a convincingly emotional Carth Onasi. Listing the other outstanding voice talent is impractical, but suffice to say that the voice work in KOTOR feels like a movie far better than the Star Wars prequel movies do. The sound effects are also faithful to the source. Everything, from blasters to doors, sound just like their movie counterparts. And the lightsaber effects, from that familiar tone of the saber being drawn to the hum and crackle of a lightsaber duel, are worth the price of admission just by themselves. Bioware has reconfigured KOTOR beautifully to run with PC controls, making full use of the mouse. Left-clicking on enemies will allow you to attack them, and queueing up a whole range of special attacks and force powers can be done without even touching the keyboard. This game runs so smoothly with a mouse and keyboard that it?s almost hard to see how Xbox owners made due with the controller. Popular gaming outlets have reported major stability issues with KOTOR. This reviewer had a couple of minor issues with the game, but those were eliminated with the application of the patch. In fact, the patch even added a couple of handy gameplay features that were not in the released build. Of course, a game should have been that way to begin with, but BioWare at least had the decency to address these issues. This game is rated T, mostly for violence, which should surprise no one. However, there is no blood or gore in the game. There is some mild profanity, but not much. Sexuality in this game is at a minimum, too, though you will run into one rather strange masseuse early in the game that seems to carry a bit of innuendo with it. There are also some ?adult situations? that include conflicts with estranged parents and some sizeable moral dilemmas. Finally, discussions of the immaterial Force and its theological implications are prevalent throughout the game, so if that bothers you, be aware. As a whole, though, this game is refreshingly clean-cut. It?s always cool to see great games accomplish their greatness without reaching into the gutter. In spite of its faults, Star Wars: Knights of the Old Republic is one of the best games I?ve ever seen or played. Most surprising of all, it is a game that is even better even than the high score I?ve given it, and a game I suspect will eventually become the stuff of legends in the gaming industry. KOTOR transcends the traditional dungeon crawling RPG experience, making it a must-play even for people who don?t like RPGs. And with the game available on the PC, there?s no excuse not to get your hands on it.